HAND Winches Crab Winches (Manually Operated & Controlled) are Robust in Construction can withstand in heavy stress conditions easy to operate. Our company has gained name and fame in presenting Gear Hand Winch. 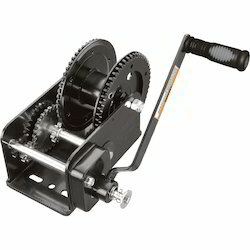 We are indulged in offering a good quality range of Hand Operated Crab Winch in the market. These ranges are made from the best quality raw materials which have been sourced from the trusted vendors of the industry. These winches have properties like durability, water resistance and minimum chance of damages which differentiate them from others. We have emerged as the foremost trader and supplier of wide gamut of Mechanical Winch. The offered equipment is used in lifting machines for lifting heavy material in various construction sites. Our offered equipment is made available in number of specifications of sizes and models for our clients to choose from. - Light weight, with great strength. - Used in many applications as per your requirements. his custom made winch is made to withstand all loads in a poultry system. Made of MS gears and body with sturdy and rugged construction and anti rust coating. It has also been provided with a manual locking plate. To satisfy the customers completely, we are into offering a wide array of Hand Winch to our customers. The Hand Winch of our company is highly reliable and perfect in finishing due to which it is demanded by customers. Moreover, this winch is tested and produced by following well defined quality norms. 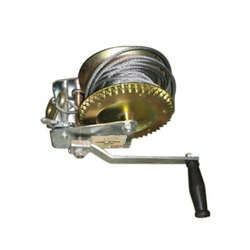 We are a trusted name, engaged in offering Wall Mounted Hand Winches with handle. These winches are stationary motors, which are hand powered or driven machine used for hoisting and hauling. Acknowledged for their long working life, good mechanical strength and low maintenance, these are available at industry leading prices to our customers spread across the country.